Map of Texas and adjacent regions, with numbering plan area 214/469/972 highlighted. 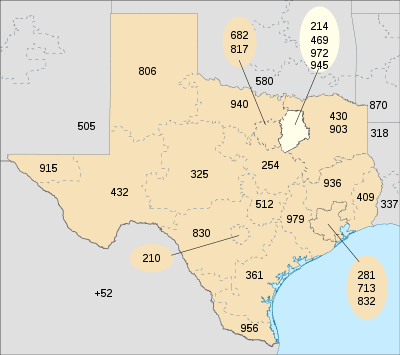 Area codes 214, 469, and 972 are the North American telephone area codes for Dallas, Texas, and most of the eastern portion of the Dallas–Fort Worth metroplex. The main area code, 214, was one of the original area codes established in October 1947. It originally covered the entire northeastern quadrant of Texas, from Fort Worth to the border with Arkansas and Louisiana. In 1954, most of Tarrant County was combined with much of the eastern portion of area code 915 to form area code 817. Despite Dallas' dramatic growth in the second half of the 20th century, this configuration remained in place for 36 years. Finally, in 1990, the entire eastern portion of the 214 area code was split off as area code 903. The 1990 split was intended as a long-term solution, but within five years 214 was close to exhaustion due to the rapid growth of the Metroplex as well as the popularity of cell phones, fax machines and pagers. Additionally, the entire Metroplex is a single LATA, so several numbers in 817 were not available for use. To solve this problem, in 1995 all of the old 214 territory outside Dallas and Dallas County was split off as area code 972. Within only two years, however, both 214 and 972 were on the verge of exhaustion. To solve the problem, area code 469 was introduced on July 1, 1999 as an overlay for most of the eastern portion of the Metroplex. At the same time, the 214-972 boundary was "erased," and 972 was converted into an additional overlay for the entire region. The result was three area codes overlaying the same area, with ten-digit dialing required for all calls. While this had the effect of allocating over 23 million numbers to an area of just over nine million people, under current projections the Dallas area will not need another area code until late 2020. Since 2000, 214 and 972 have served as overlays for portions of eastern Tarrant County (Arlington, Bedford, Euless, Grapevine, Southlake, and Colleyville) which are closer to Dallas. Addison, Allen, Anna, Arlington, Avalon, Bardwell, Bedford, Blue Ridge, Carrollton, Cedar Hill, Celina, Cockrell Hill, Colleyville, Combine, Copeville, Coppell, Crandall, Dallas, DeSoto, Duncanville, Elmo, Ennis, Euless, Farmers Branch, Farmersville, Fate, Ferris, Flower Mound, Forney, Forreston, Frisco, Garland, Glenn Heights, Grand Prairie, Grapevine, Highland Park, Highland Village, Hurst, Hutchins, Irving, Italy, Josephine, Kaufman, Lancaster, Lavon, Lewisville, Little Elm, Lucas, Maypearl, McKinney, Melissa, Mesquite, Midlothian, Milford, Murphy, Nevada, Oak Leaf, Palmer, Pecan Hill, Plano, Princeton, Prosper, Red Oak, Rice, Richardson, Rockwall, Rosser, Rowlett, Royse City, Sachse, Scurry, Seagoville, Sunnyvale, Talty, Terrell, The Colony, University Park, Venus, Waxahachie, Westminster, Weston, Wilmer and Wylie. In addition, Dallas-Fort Worth International Airport is served by area code 972.